Details of the latest issue of Astronomy Now are available here. Don't miss out, subscribe for just £33 per year. 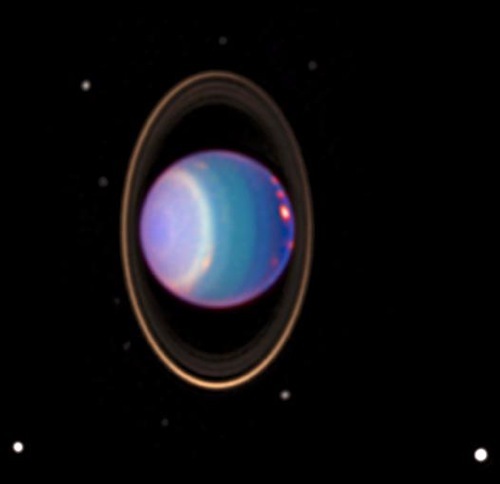 This false colour image of Uranus reveals around 20 clouds on the distant planet, nearly as many clouds on Uranus as the previous total in the history of modern observations. Image: NASA/JPL/STScI. This Hubble image uses visible light to reveal cloud structure in Uranus's atmosphere. The image on the left is taken at 5,470 Angstroms, which is near the human eye's peak response to wavelength. Colour has been added to the image to show what a person on a spacecraft near Uranus might see. Little structure is evident at this wavelength. 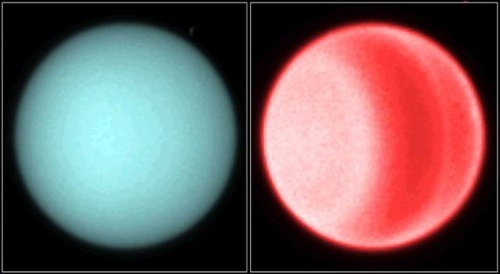 The right hand image is taken at 6,190 Angstroms, and is sensitive to absorption by methane molecules in the planet's atmosphere, revealing the banded cloud structure of the distant planet. 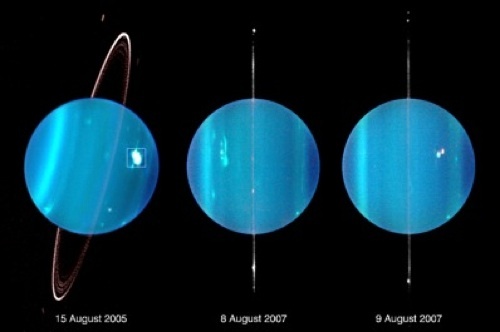 Ground-based observations from the Keck telescopes reveal the changing seasons on Uranus, and winds that blow up to 900 kilometres per hour. The images reveal changes in the brightness of cloud bands in the planet's northern and southern hemispheres as well as changes in two previously observed and apparently long-lived discrete cloud features. One is a massive vortex that had been oscillating in Uranus's southern hemisphere for several decades between 32 degrees and 36 degrees latitude. In 2004, the feature began drifting north, and may soon dissipate. Image: Imke de Pater, University of California, Berkeley; Heidi Hammel, Space Science Institute; Lawrence Sromovsky and Patrick Fry, University of Wisconsin-Madison. Obtained at the Keck Observatory, Kamuela, Hawaii.